The pitch-perfect casting of Search Party is undoubtedly one of the key reasons the debut season of this hard-boiled comedy became the sleeper hit of the last couple of years. Slowly gaining the kind of word-of-mouth traction that the New York millennial elite it represents would eat up, it made a dozen Best Shows Of 2016 You’re Not Already Watching roundups – most making a point to highlight the comedy chops of its actors. It’s hard to pick which performance delights me most. Is it Alia Shawkat’s leading turn as Dory, whose mounting obsession with missing person and mild acquaintance Chantal Witherbottom (Claire McNulty) drives the season to its chilling finale? Or Parker Posey’s unhinged portrayal of a jewellery store owner/cult member named Brick? The main and supporting casts are filled with roles which seamlessly skirt the naturalistic performance styles of a show like Girls (a comparison that’s been run into the ground with Search Party, but it fits) and the OTT caper hijinks reminiscent of, honestly, the live-action Scooby-Doo movie. But if there’s one performance which is a true stand-out, hypnotic in its physicality and magnetic in its layers, it has to be John Early’s Elliott Goss. Narcissistic, spoilt, two-faced, gay, social media-obsessed and performatively altruistic as the head of a fashionable water bottle charity, Elliott is the fey incarnation of every baby boomers’ most seething millennial thinkpiece. Elliott discusses his publishing deal in one of the many brunch-debrief scenes in 'Search Party'. Bouncing between total self-aggrandisement and total lack of self-doubt in what can only be described as this decade's Best Costuming for a Gay Male, Elliott adds impish joie-de-vivre to the core cast. While his fellow millennials are paralysed by tortured authenticity, seeking meaning in abstract notions of purpose, truth or justice, there’s something hugely dynamic about the shallowness of Elliott, the immediacy of his goals and the shortcuts he’s willing to take getting there. In the penultimate episode of season one, Elliott champions the utility of lying. “When are you nerds going to accept that lying is a tool?” is an Elliott line that has haunted me this past year, delivered so matter-of-factly by Early that it’s become the internal soundbite for my deception-enabling id. Effortless lying is also what sets Elliott apart as one of the most realised gay characters on television right now – indeed, only a straight person could view deception as anything other than a key survival skill. As the new normal for season two makes lying a daily necessity for every character, Elliott's effortless deceit becomes the most valuable asset the friends have. Early is phenomenal at acting acting, the kind of mask work so nuanced that you can tell exactly when Elliott’s deceit is premeditated smoke’n’mirrors or water-treading improv, moment to moment. But Early is much more than a phenomenal actor in a particular role. If you’re like me, your Search Party obsession has led to digging into his oeuvre to find he’s equally as phenomenal as a stand-up, improviser, writer and filmmaker. If you’re not like me, but still keen for a slice of that oeuvre, I gotcha. A harrowed Early appears on YouTube talk show 'This Week Had Me Like'. 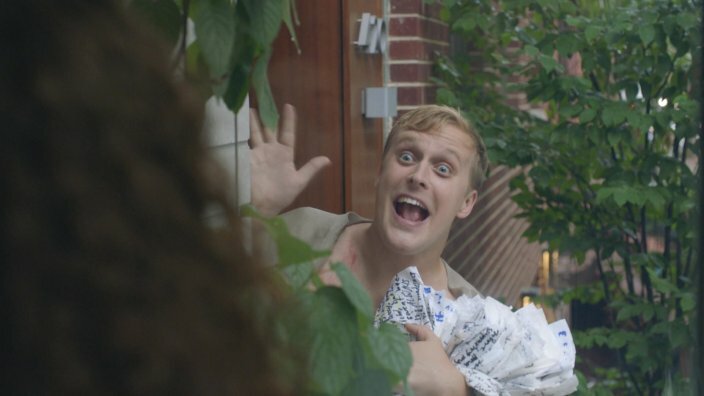 While seeing his progression as a live performer over the past eight years is impossible for Aussies, a deep dive into his early YouTube content (under username bejohnce) gives a snapshot into the beginnings of his comedic sensibilities. Adding a level of performativity through the stakes of a speech, Leslie’s dialogue includes Early specialties like non-sequitur bragging (“Every Saturday I volunteer at a daycare centre”), clearly exaggerated emotions (“Oh God, now I’m choked up. Mom, I owe you 10 bucks”) and, last but not least, an unfounded confidence in blatantly awful material (“...At the drop of a dime, nickel or euro… I’m talking about you, Gregor!”). The heightened opportunity for flexing that speeches provide is something Early has locked onto in sketches throughout the years, including that of a eulogy in 2014’s Loss (“I was dating women at the time exclusively, and I was very, very sexually active”), 2015’s Dinner Party (“You have been so supportive... despite the imbalance of where we are in our careers right now”) and perfected in his 2016 The Characters special (available to watch on Netflix) at a wedding rehearsal. In 'The Characters', John, as played by Early, gives a vaguely genuine speech at his wedding rehearsal dinner. The commodification of authenticity is a machine that Early’s comedy regularly rails against. In an interview earlier this year on Pete Holmes’s You Made It Weird podcast, Early asks, “How dare you think sincerity looks a certain way?” Indeed, by skewering the performativity people carry with them in real life, Early’s work often arrives at a much realer (and funnier) truth. In its gall, this kind of real-world performance art begs the question: is an explicitly fictional character much more of a performance than a “real” person promoting a product or themselves on TV? Nothing more hilariously illustrates Early’s discontent with unexamined facade than his recent, minute-long rant on Las Culturistas podcast about Anna Kendrick calling her memoir Scrappy Little Nobody. In his words, “absolutely inexcusable”. Both the magic and the hypocrisy of show business is the thematic link for 555. The Vimeo series stars Early alongside long-time collaborator and comedic soulmate Kate Berlant – an equally genius performer who also plays Elliott’s editor in season two of Search Party. An anthology of five hilarious films, 555 offers Berlant and Early a diverse range of roles to flex their effortless comic chemistry. The series is an unflattering but ultimately apt portrayal of this generation's discontent. As new art reveals, when the critically adored Search Party returns for its second season, it will have a very strong Hitchcock vibe.